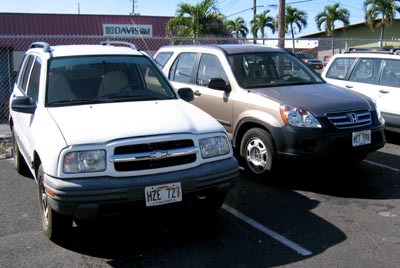 My car at the auto shop, on the left, my rental on the right. Dropped by the shop today, hopped into my car and of course it started right up. The starter motor is failing and has an intermittent problem doing so. So far I’ve been lucky enough not to be someplace like on the summit and not have it start up but I’ve been rolling the dice, so I’m driving the rental one more day as a new starter is put into my car. I should be good to go after that. So it was like the car was playing dead yesterday, only to work like nothing’s wrong today. I must admit, the rental is a pretty cushy ride.